ZERO_TOLERANCE_ZTPOUCHZero Tolerance Zipper Storage Case. 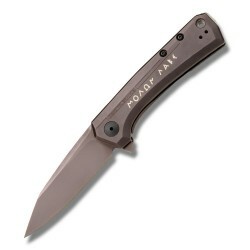 Fits folding knives up to 5 1/4" closed. 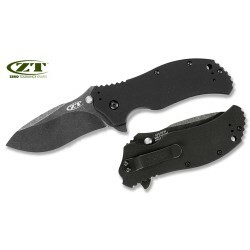 Black leatherette construction with Zero Tolerance logo. White sheep skin lining. Bulk packed. 4 1/2" closed. 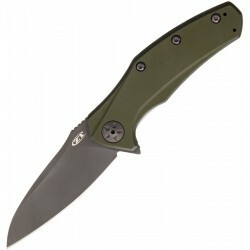 3 1/4" S30V stainless blade with dual thumb studs and urban camo finish. Ken Onion design Speed-Safe assisted opening mechanism. 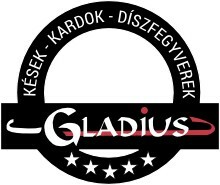 Black G-10 handles with repositionable stainless clip and lanyard hole 0,45 lbs Csak előrendeléssel , 50 % előleg befizetése után rendeljük , miután leegyeztettük a szállítást ! 4 1/2" closed. 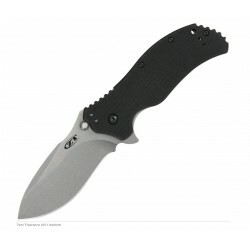 3 1/4" S30V stainless partially serrated blade with black Tungsten DLC coating and dual thumb studs. 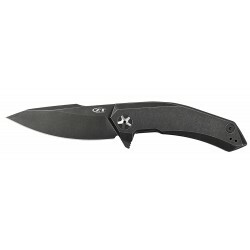 Blade features Speed-Safe assisted opening. Matte black textured G-10 handles. Lanyard hole. Reversible black finish stainless pocket clip. Csak rendelésre , 50% előleg befizetése után rendelhető! Száll.hat.idő 4-8 hét. 5 1/8" closed. 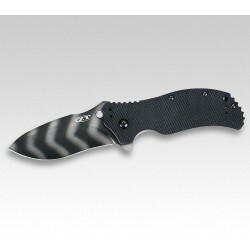 3 3/4" S30V stainless standard edge tiger stripe blade. Blade features Speed-Safe assisted opening and can be deployed one-handed with the dual thumb studs or index finger protrusion. 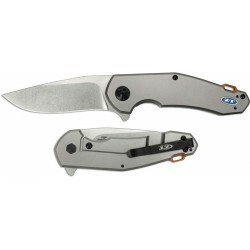 Sure-grip handles are a combination 3-D machined G-10 and titanium. Lanyard hole. Reversible black finish stainless pocket clip. 0,6 lbs. 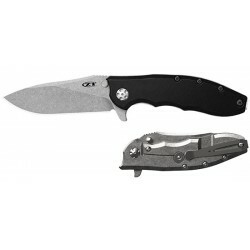 Type: Assisted Opening; Closed: 4.25"; Blade: 3.25" l S35VN Stainless l Standard Edge; Handle: Green l Aluminum; Other Info: Thumb Ridge l Extended Tang l Pocket Clip. Black DLC coated blade. Serlialized. Boxed. CSAK ELŐRENDELÉSSEL , 50 % ELŐLEG BEFIZETÉSE ÉS A SZÁLLÍTÁS LEEGYEZTETÉSE UTÁN RENDELHETŐ ! 5" closed. 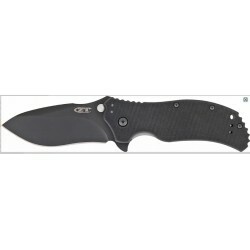 3 1/2" blackwash finish CPM-S35VN steel harpoon-style blade with extended tang. KVT opening mechanism. 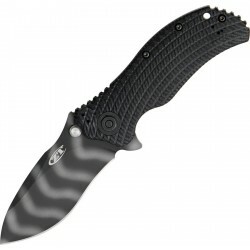 Blackwash finish titanium handle with two-tone pivot. Stainless pocket clip. 0,45 lbs. CSAK ELŐRENDELÉSRE , 50 % ELŐLEG BEFIZETÉSE ÉS A SZÁLLÍTÁS EGYEZTETÉSE UTÁN RENDELHETŐ ! Closed: 5"; Blade: 3.5" l S35VN Stainless l Standard Edge l Bead Blast Finish; Handle: Gray l Titanium; Other Info: Lanyard Hole l Pocket Clip l Extended Tang l Inlay Shield. Modified drop point blade. KVT ball bearing system. Orange anodized aluminum backspacer. Boxed. CSAK ELŐRENDELÉSRE , 50 % ELŐLEG BEFIZETÉSE ÉS A SZÁLLÍTÁS EGYEZTETÉSE UTÁN RENDELJÜK !